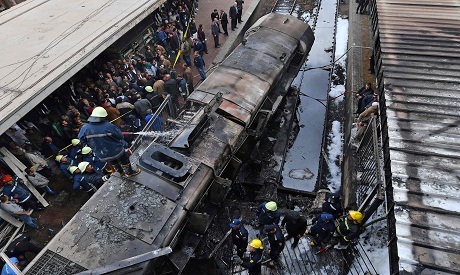 At least 20 people were killed and 43 others were injured when a blaze broke out due to a train crash in Cairo's Ramses Railway Station early Wednesday, according to the health minister. Security sources told Ahram Online that the train driver left the train unattended after getting into a row with a colleague. Police have arrested the train driver believed to be responsible for the accident after he had fled the scene and returned to his hometown in Minoufiya governorate north of Cairo. CCTV video circulated online shows that the locomotive was left unattended at a train yard after its driver jumped out to speak with the conductor of another train that crashed into the first locomotive. The locomotive then sped off towards the railway station as its motor was left running when it was abandoned by the driver. Prime Minister Mostafa Madbouly accepted the resignation of Minister of Transportation Hisham Arafat shortly after the accident, Al-Ahram Arabic news website reported. Madbouly has delegated Minister of Electricity Mohamed Shaker to take charge of the Ministry of Transportation after the resignation of Minister Arafat. 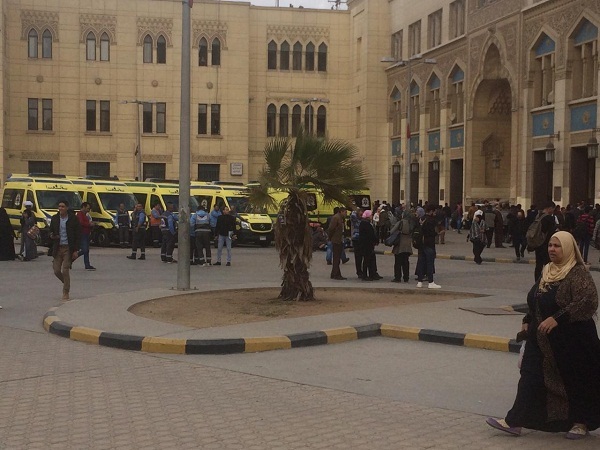 One of the wounded has suffered massive injuries, and others are in critical condition, said Health Minister Hala Zayed, adding that most of the deceased have not yet been identified. The Railway Authority has said in a statement that the fire broke out after a train collided with concrete barriers at the station. Prime Minister Madbouly said in a brief statement that the reason behind the train collision is still unknown. The footage shows people being engulfed in flames and bystanders attempting to put them out. Egyptian President Abdel-Fattah El-Sisi told reporters that he has instructed the government to "immediately go to the scene of the incident and to hold those responsible accountable after conducting the necessary investigation." The office of the country's top prosecutor said in a statement that it has ordered an immediate investigation into the incident. "Everyone has to know that the life of every Egyptian is valuable to me and to the Egyptian state, and we will not rest until we hold accountable anyone found to be neglectful in their job," the prime minister stressed. Madbouly said that Health Minister Zayed is closely following the treatment of the injured. Security officials have partially closed entrances to the train station. Egypt's Railway Authority has said in an official statement that all train traffic, with the exception of the railway where the incident took place, is back to normal after being suspended following the accident. PM Madbouly, Transport Minister Arafat, and Social Solidarity Minister Ghada Wali have visited the site of the incident. 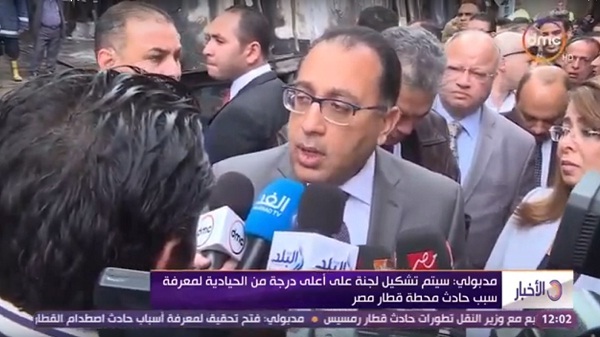 Minister Wali has ordered for EGP 80,000 to be payed to each of the families of those killed and EGP 20,000 to the injured. 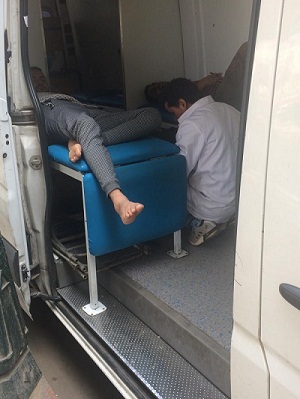 The Egyptian Red Crescent has started a campaign asking travellers to donate blood for those injured in the incident. In July 2018, Minister of Transportation Arafat said that EGP 55 billion had been allocated to develop Egypt’s railway infrastructure in a five-year overhaul programme. In the same year, the Ministry of Transport obtained a loan for importing and manufacturing 100 locomotives from the European Bank for Reconstruction and Development at EGP 5.8 bn. In the past two decades, Egypt's railways saw a record number of deadly train accidents. The deadliest train accident was in February 2002, when a train packed to double capacity caught fire and killed 373 in Al-Ayyat.